Interstate 470 in Kansas provides a bypass loop of Interstate 70 and the Polk-Quincy Viaduct through Downtown Topeka. The western half, Dr. Martin Luther King, Jr. Memorial Highway, constitutes a commuter route and part of U.S. 75, a major north-south route topeka. 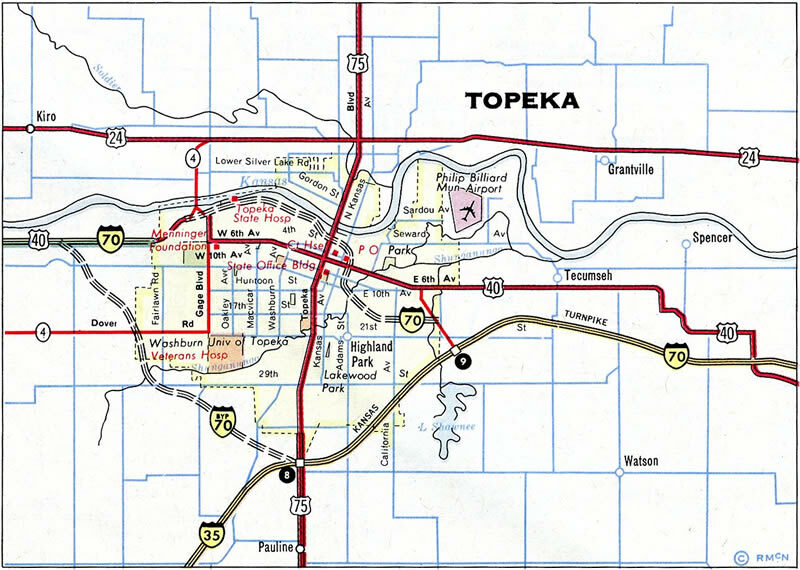 The eastern half runs along the tolled Kansas Turnpike between Interchanges 177 and 183. 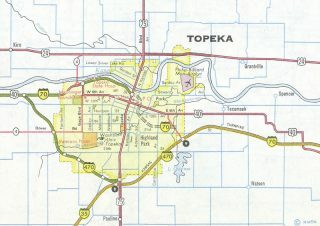 The 2001-realignment of Interstate 70 at the East Topeka Interchange slightly extended I-470 east to beyond the site of the former Topeka Service Area. 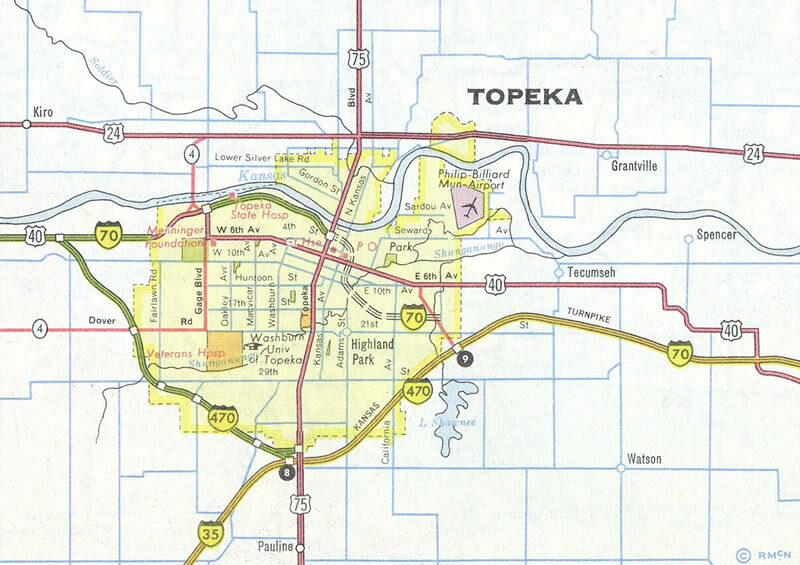 The Topeka Inset in the 1960 Rand McNally Road Atlas showed Interstate 470 as Bypass I-70. 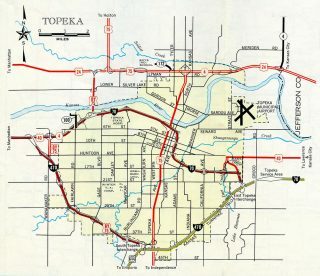 A substandard connection previously connected Interstate 70 with the original East Topeka Interchange and U.S. 75 Bypass was designated along the free portion of Interstate 470. Interstate 470 angles northeast between an array of subdivisions to the west of Lake Shawnee on the two mile approach to Exit 182 with Interstate 70, U.S. 40 and K-4. Photo taken 06/18/15. Exit 182 branches north from Interstate 470 east to form the beginning of the Oakland Expressway, a 5.33 mile long freeway linking I-70 with U.S. 24 across the Kansas River. U.S. 40 and K-4 utilize the freeway on their respective paths to Tecumseh and Valley Falls. Photo taken 06/18/15. SE Wittenberg Road spans Interstate 470 (Kansas Turnpike) a half mile west of the wye interchange (Exit 182) with the Oakland Expressway. Traffic departing ahead can use a loop ramp for Interstate 70, U.S. 40 & K-4 west to Downtown Topeka. Photo taken 06/18/15. The Kansas Turnpike mainline turns east with two lanes through the former Topeka Service Plaza area to overtake I-70 east to Lawrence and Kansas City. U.S. 40 parallels the tolled section of Interstate 70 to Bonner Springs. Photo taken 06/18/15. An end shield for Interstate 470 stands between the Croco Road overpass and Oakland Expressway flyover. The eastbound lanes extend another 1.4 miles before merging with Interstate 70. Photo taken 06/18/15. I-70 advances west from the Topeka Service Area to split with the Kansas Turnpike and I-470 at Exit 183. Photo taken 10/17/04. Both Topeka interchanges from the Kansas Turnpike are connections to freeways: Exit 183 serves I-70 west, U.S. 40 and K-4 while Exit 177 joins I-470 with Dr. Martin Luther King, Jr. Memorial Parkway through southwest Topeka. The 2001 revision of Exit 183 added ramps to K-4 (Oakland Expressway) and U.S. 40 east to Tecumseh. Photo taken 10/17/04. A second in a series of diagrammatic overheads outlines the two-lane off-ramp (Exit 183) for Interstate 70 west and the continuation of the Kansas Turnpike mainline south as I-470 west. The toll road travels southwest from Topeka as I-335 to Emporia, where it meets Interstate 35. I-35 overtakes the Turnpike from there to Wichita, Wellington and the Oklahoma state line by South Haven. Photo taken 10/17/04. Opened in August 2001, the revised split of Interstates 70 and 470 west provides a smoother connection to I-70’s westbound continuation as well as reduced delays at the toll plaza. Work added a new set of roadways for I-70 to directly connect the Kansas Turnpike with the preexisting freeway west from Rice Road. Additionally the original Topeka Service Plaza was demolished, with a new $14 million facility opened by July 2002, five miles to the east.5 Photo taken 10/17/04. The turnpike and Interstate 70 diverge at a wye interchange. A directional interchange located nearby, joins the departing I-70 with the Oakland Expressway north to U.S. 40 east, U.S. 24 across north Topeka and K-4 north to Meriden. Photo taken 10/17/04. A folded diamond interchange (Exit 365) was constructed at Rice Road as part of the East Topeka interchange project between 1997-2002. The exit replaced a partial interchange and access road leading south from I-70 to the original trumpet interchange with the Kansas Turnpike. Photo taken 10/17/04. A new terrain alignment added for Interstate 70 in 2001 takes the mainline seamlessly east onto the Kansas Turnpike to Lawrence and Bonner Springs. U.S. 40 & K-4 branch north from I-70 at Exit 366 for the Oakland Expressway while I-470 extends the toll road to south Topeka. Photo taken 10/17/04. All traffic bound for Interstate 470 (Kansas Turnpike) west, U.S. 40 east to Tecumseh and K-4 north to U.S. 59 at Nortonville departs from Interstate 70 east in unison at Exit 366. Photo taken 10/17/04. Motorists partition into ramps for the Oakland Expressway as part of the directional interchange joining it with Interstate 70. The K-4 freeway ends prematurely at U.S. 24 just north of the Kansas River bridge. The super-two is proposed to extend northward to NE 46th Street, but a lack of funding has halted work since 2000. Photo taken 10/17/04. U.S. 40 west combines with K-4 (Oakland Expressway) south from 6th Avenue. ramps for Interstate 70 and 470 follow in just 0.75 miles. Photo taken 06/19/15. U.S. 40 commences a 289-mile overlap with Interstate 70 west across the state to Oakley. K-4 follows the freeway for just 12.7 miles to Exit 353. Photo taken 06/19/15. A left-hand ramp takes motorists onto Interstate 70 (Kansas Turnpike) east to Kansas City while the Oakland Expressway mainline continues directly to Interstate 470 for the turnpike south to Wichita. Photo taken 06/19/15. A viaduct spans both Wanamaker Road and Huntoon Street at Exit 1B as Interstate 470 west & U.S. 75 north near the semi-directional T interchange (Exit 1A) with Interstate 70-U.S. 40 & K-4. Photo taken 10/31/16. Ground level shields reference the overlaps of U.S. 40 & K-4 along Interstate 70 topeka at the west end of Interstate 470. This is typical KDOT practice for secondary routes along an Interstate mainline. U.S. 75 overlaps with I-70 east for 1.93 miles to a separate freeway spanning the Kansas River north to NW 46th Street. Photo taken 10/31/16. Single lane ramps connect I-470 west with Interstate 70 east to Downtown Topeka and west to Junction City, Salina and Denver, Colorado. Photo taken 10/31/16. An end Interstate 470 Kansas shield resides along the ramp to Interstate 70-U.S. 40 & K-4 west ahead of the Urish Road overpass. Kansas 4 departs the freeway at the ensuing exit for Eskridge. Photo taken 10/17/04. An interchange sequence sign posted one mile ahead of Interstate 470 east & U.S. 75 south (Exit 455) on I-70-U.S. 40 & K-4 west. Photo taken 06/18/15. A loop ramp joins Interstate 70 west from Wannamaker Road just one quarter mile ahead of the flyover (Exit 355) taking U.S. 75 south onto Interstate 470 east. Prior to 1990-92 road work, Wannamaker Road provided a surface route connection to I-470 from a six-ramp parclo interchange. Photo taken 10/31/16. The flyover taking motorists onto Interstate 470 east & U.S. 75 south to Carbondale, Lyndon and Wichita was added to Interstate 70 by 2002. Photo taken 06/18/15. K-4 east accompanies Interstate 70 & U.S. 40 east from Exit 353 to the semi directional T interchange (Exit 355) with Interstate 470 east & U.S. 75 south. SW 10th Avenue (old K-10) parallels the south side of the freeway on this stretch. Photo taken 10/17/04. Interstate 70-U.S. 40 & K-4 crests over 1,000 feet above sea level across the bluffs south of the nearby Kansas River. The freeway gradually lowers to partition with Interstate 470 east. I-470 provides a bypass of Topeka for the narrow stretch of I-70 along the Polk-Quincy Viaduct by Downtown. Photo taken 06/18/15. U.S. 75 travels southeast along Interstate 470 as part of its bypass of Topeka between the northern suburbs and Topeka Regional Airport (FOE). 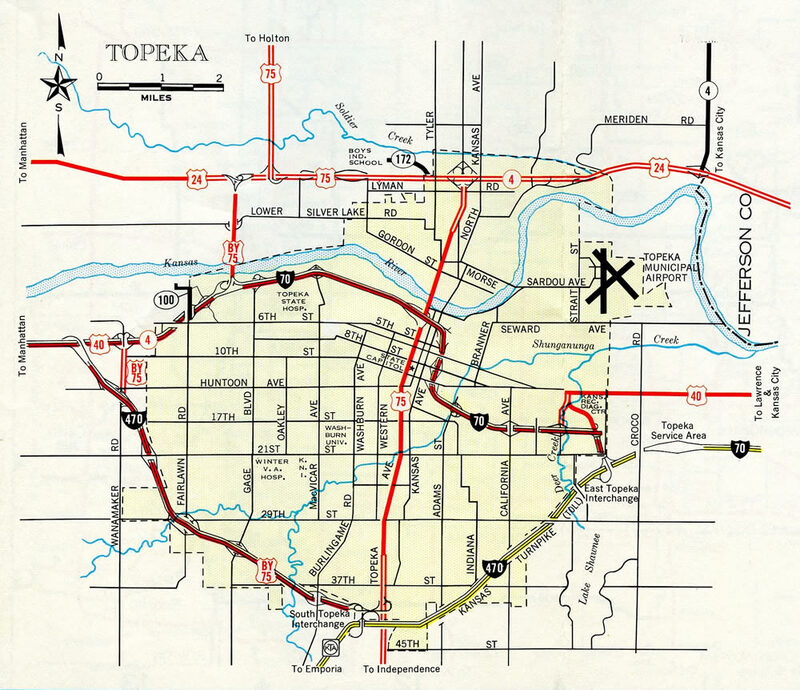 The former alignment followed Topeka Boulevard from the Kansas Turnpike north to U.S. 24. Photo taken 10/17/04. Exit 355 parts ways with Interstate 70-U.S. 40 & K-4 east for Interstate 470 east & U.S. 75 through the southwestern reaches of Topeka to Interstate 335 (Kansas Turnpike). Photo taken by Ben Prusia (2002). A simple wye interchange (Exit 355) connected Interstate 70 east with I-470 east, with U.S. 75 Bypass south joining the belt route from nearby Wannamaker Road. U.S. 75 was relocated from its surface route through the capital city once the new freeway south from I-470 opened to traffic. AASHTO approved both the realignment of U.S. 75 to I-470 and the elimination of U.S. 75 Bypass on April 19, 1998. Photo taken by Michael Summa (1984). "New interchange opening – $94-million project will open more direct routes for Topeka commuters." Journal-World (Lawrence, KS), August 1, 2001. "Two lanes of I-70 to stay open for games." KUsports.com, August 25, 2005. "Kansas Turnpike lane widening planned from city to K-7." Lawrence Journal-World (KS), April 4, 2010. "Turnpike travelers find service-area changes." Lawrence Journal-World (KS), May 12, 2002.